Steve Ballmer had a lot to say about Windows 7 during his keynote address at the start of CES 2010, and gave a sneak peek at the swanky machines it is–and will be–running on. And that’s about all he did. Little information was revealed about the tech specs. But from Ballmer’s demo of Amazon’s Kindle software on the Windows 7 device, along with a quick video clip, and a promo clip from HP (above) we could see it ran pretty quickly and had a multitouch screen…with something like a 7-inch size (shown below, in an image from GDGT). Steve and MS’s senior product manager Ryan Asdourian also showed a huge bunch of other PC techs. 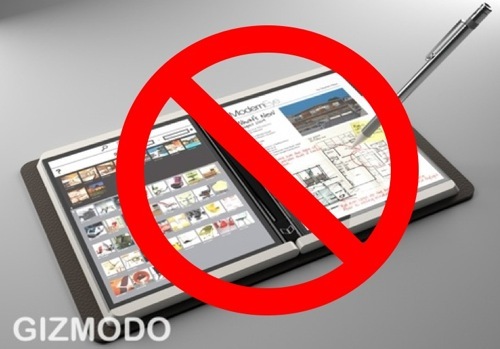 They noted the Dell Adamo XPS is thinner than four poker chips, they demoed netbooks and the crop of tiny nettops that can be slid behind HDTVs, and they even found time to mention e-books. Dropping a mention for Kindle, the Nook, Sony e-Reader and Ray Kurzweil’s Blio e-Reading system (which leverages MS tech) was a nice move, but the pair then noted that you can do all this and more on a PC. 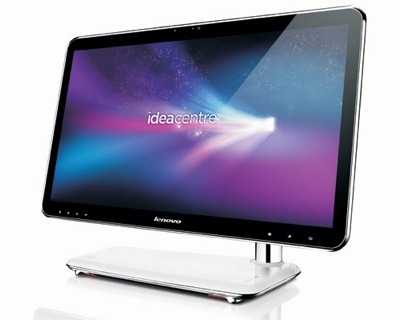 The presenters gave some of their biggest compliments to Lenovo (which has been in the CES news a fair ‘ol chunk already) with its A300 all-in-one PC, touted as the industry’s slimmest at just 18.5mm front to back. The Core 2 Duo machine, with a 21.5-inch “full HD” screen comes with niceties like an 8-way card reader, HDMI port, and both analog and digital TV tuners built in. But it wasn’t the tech specs Ballmer was praising so much: Nope, it was the fact that a Win7 machine was so skinny. Hmm. The current 21.5-inch iMac (which, let’s face it is really what the A300 is competing with) is 18.85cm front to back including its stand–the depth of the machine isn’t mentioned on Apple’s site, as really all you care about is footprint on your desk. 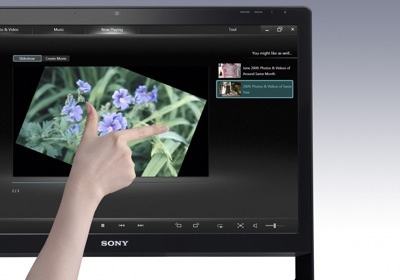 At least the other all-in-one MS professed some love for is a serious Apple competitor: The 24-inch Sony Vaio L. It has infrared multitouch for one, and Blu-ray support (which Steve Jobs once famously described as a “bag of hurt”) for another. It also has TV and digital video recorder powers…which kind of positions it as a bit of an Apple TV killer, since Apple’s pet project can’t do this despite a long tail of rumors and dreams to the contrary. But Ballmer’s speech was equally notable for what it wasn’t all about: Anything to do with the futuristic Courier tablet. Brian Lam of Gizmodo and Kara Swisher at AllThingsD got the rumor mill spinning earlier with flat denials that Ballmer would mention Courier, noting that instead he’d concentrate on the HP slate machine. Which is what he did–although he revealed almost nothing about it other than its existence as a Win7 device. And frankly, that’s no surprise. The Courier concept as leaked via Gizmodo all those months back has more in common with Microsoft’s fictional Vision of 2019 computing machines than PC hardware–and, more importantly, Microsoft’s own software–that’s technically feasible today. Instead we learned about HP’s machine, and how wonderfully Windows 7 plays with it. A fabulous marriage of hardware and best-selling software it may be, but Courier is no Win7 machine, and HP’s slate is no Courier. Which all, of course, spins the spotlight right back around at Apple, with its purported January 27th launch event for the iSlate. Will the Steve-note deliver what Ballmer’s keynote couldn’t?